After a several months very busy, i decide make a post of my first harvest in Alentejo. Was a very short vintage, less then 2 months. The weather was not very hot, very good for a slow maturation of the grapes. In my opinion a excelent year for red wines. The syrah variety gave to us a complex wines, with a lot of fruit in the nose, with a good balance in the mouth, with good tanins, good struture, concentration.... we have a lot of expetations. Touriga Nacional was very good to. Less floral but very good fruit mixed with violets, very strong in the mouth, need some time to get more round. I think we can make very good 2008 wines. In the future i hope we are aloud to make better white wines, with more experience we can make a reserve one. After a very interesting experience in Chile, for Harvest time, I am now finally back at home! So…to start I opened a bottle of this wine at Almeida´s place ( it is always such a nice time that we spend there usually with his family and specially with his father that knows a lot of the wine business and always adds something interesting to the conversation) and if for me it wasn´t a surprise because I´ve tasted it in Chile, I think for my friends it was a nice one! Made with 70% cabernet and 30% Carmenére ( a almost “dead” French grape variety that is now one of Chile´s most appreciated ones), was a excellent nose, with a lot of freshness, green peppers, spicy (a bit look-a-like Touriga Nacional I think) and in the mouth shows very round tannins, good attack , balanced, nice acidity, but being a “easy to drink” wine I think its´time to drink it showing now all his potencial. Has a good mouthfeel with a spicy finale. A really nice wine to drink and with a very good QPR. Drink it now. 88 points. This is their top quality wine... the grapes come from old, south face vineyards planted mostly with Touriga Nacional, Tinto Cão and also Sousao... 6000 bottles were produced! I had 2... the first time I tasted it was a couple of months ago, with my father... and the second was last Friday with friends... Previous point... the first bottle showed much better than the second one... The second previous point... the wine we had Friday should/had to be decanted like the first bottle I had ... in the beggining it showed a mettalic aftertaste that, after a hour in the glass it started to disappear.... :) Dark red colour starting to show the evolution with some brown hints on the rim. Attractive sweet herby, caramelly aroma to the slightly porty style. Good concentration and interesting ripe herby notes. Good acidity, mouth volume, and domesticated tannins make it very pleasent drinking. Still it wasn´t a consensual wine... and imagine the discussion if we knew how much it is afford...something like 90€ a bottle... didn't pay for it... and so.... not knowing the price I would say that for the 2 bottles I had (one better the other less good) it worth... 89 Points... no comments on the price... really! Cheers! Long time no see... :) I have been away for almost 3 months... work and some other stuff didn't allow me to post in this long... long period.... tasted some good things thow! Finca Flichman from Argentina is one of the international brands of Sogrape, the biggest Portuguese wine group well known for producing the Mateus Rosé, which recently acquired Framingham, in New Zealand and Chateau los Boldos, in Chile. My friends, its been quite a busy time for me last month! to be honest, I havent´t been tasting that much (apart from my work, where tasting is a part of the day...) due to the fact that I´m leaving for Chile for 2008 harvest and a lot of things to do before departure! Well.... I will try to make up by posting some Chilean wines that for sure I will taste....looking forward to do it! The Quinta de Côa belongs to CARM, a wine company which is also known for producing top quality olive oils. Their vineyards are located around the village of Almendra, within the finest area of the Douro Superior. This 06 white is made from the grape varieties, Côdega de Larinho, Rabigato and Gouveio and aged in new French oak barrels. Light straw yellow colour. Mineral nose, lemon, tropical with hints of pineapple and passion fruit. Attractive mouth feel, citrus, minerality again, freshness, lots of fruit combined with toasty flavours from new oak. Nice acidity with medium finish. Not profound but nice enough and a versatile food wine. I really liked it, so much so that I drank the full bottle by myself. Unfortunately, I’ll not buy this wine again. It’s bottled with synthetic corks. I’m Portuguese and proudly protect what is ours. A bottle of wine has to be bottled with corks. Simple as that! For me, Wine is culture, tradition and identity. 99-100 Points: A jaw-dropping, heart-stopping effort—not just everything you’d expect, but MORE than you could reasonably expect from a wine. 96-98 Points: Overwhelming. A rare level of greatness for wines that knock your socks off with their massiveness or make your hair stand on end with their elegance. 92-95 Points: Rocking wines that achieve something special within what they try to be. Occasionally wines in this range are a bit one-dimensional, but that one dimension will blow you away. 90-91 Points: High quality wines that make you go back to the glass looking for (and usually finding) something more. Wines that are not just enjoyable but pique one’s curiosity. 85-89 Points: Above average wines that perhaps lack that little something extra that makes them worthy of a 90-point score. Satisfactory. Drinkable and unobjectionable. 80-84 Points: Something about the wine just rubs you the wrong way, but it has some redeeming features. 70-79 Points: Very average wines capable of quenching thirst but little else. Straightforward and unremarkable. 60-69 Points: Flawed wines to avoid at all costs. Practically undrinkable. 50-59 Points: So poor that the 60-69 range is insufficient to describe their inadequacy. Undrinkable. Well...Saturday night and time to go out for dinner with some friends! For me, Codfish can be appreciated both with red and white wine, so this time we decided to taste a white wine called Muxagat 2004. This wine, Douro Superior, made with rabigato, codêga and viosinho, 13% vol, with a nice yellow-straw, golden colour, excelent nose, very aromatic with lemon, honey, also some smoked notes and with a elegant cask background also. Once on the mouth, very fresh, balanced, nice acidity and again elegant and well integrated wood, showing a nice barrel work. With a persistent and equilibrated finale, makes a very nice set! Drink now or wait a while. 84 pts. This wine, the second brand of the famous Quinta do Vale Meão in the Douro Superior, reached the 64th on the 2007’s top 100 Wine Spectator with 91 pts. Made from 5 grape varieties, 40% Tinta Roriz, 25% Touriga Nacional, 25% Touriga Franca, 5% Tinta Barroca & 5% Tinta Amarela. The crush was done in lagar and the fermentation in stainless steel tanks. Aged in oak barrels of 2 and 3 years until the bottling in June 2007. Tonight, with a home-made chicken in the hoven, I decided to taste one of Churchill Graham´s first table red wine, the Churchill´s 2000. Made from Touriga Franca, Tinta Roriz and Touriga Nacional, with 12% of alcohol content. This wine is a new creation of Fundação Eugénio de Almeida. Made with Cabernet Sauvignon and Merlot, aged 19 months in new french oak barrels. With a dark colour, the wine shows a mix of red fruits and floral aromas (this last one, very tipical from Cabernet). In the mouth, starts with a very strong beginning, showing a good balance between fruit and oak. At the end, some green notes with not a very long finish. 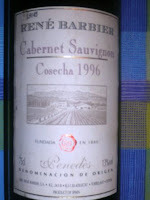 With almost 12 years of age, this Spanish Cabernet Sauvignon produced by René Barbier, presented a almost brown colour, oxidated and clean. On the beginning it was closed on the nose but after a few minutes it lost all the shyness and showed the fruit, very matured with also some spicy notes. Once on the mouth, it was balanced and round showing elegancy and also fine tanins but maybe lacking a longer end. This wine done by Bago de Touriga, a “join-venture” between Luís Soares Duarte and João Roseira, is made from old vineyards in the Douro Superior. The fermentation occurred in lagar and the malolatic in tanks. The wine aged 21 months in new french oak and were produced 3500 bottles without filtration.